This is the next in a long list of requests from an Etsy customer. He likes to draw up his own concepts and pays me to bring to live as a plush. I am always curious has what he going to come up with next. Arva is a relative easy concept compared some of the others that he has requested so far. Worsted weight yarn: red, gold, black, buff, white, gray, and light blue. BEGIN STUFFING THE ARMS FIRMLY. CONTINUE STUFFING AS YOU GO. Finish off leaving a long tail. Wrap BRACELET around ARM and sew together. Weave in ends. Rd 12: Ch 1, working side of Rws, sc in next 6 Rws, slip st in next 9 unworked sc of Rd 5, working side of Rws, sc in next 6 sc, working in sc of Rw 11, sc in next 2 sc. BEGIN STUFFING BODY FIRMLY. CONTINUE STUFFING BODY FIRLY AS YOU GO ALONG. Rd 21: Ch 1, turn; sc in next 5 sc, holding next sc on BODY and sc #2 on RIGHT ARM together and working through both thicknesses, sc in next 2 sc, change to buff, 3 sc in next sc on BODY, (sc in next 7 sc, 3 sc in next sc) twice, change to red, holding next sc on BODY and sc #7 on LEFT ARM together and working through both thicknesses, sc in next 2 sc, sc in next 4 sc on BODY, slip st in first sc. ADD A LITTLE EXTRA STUFFING TO BREASTS AREA. With black, ch 11. Finish off leaving a long tail. Sew GARDER STRAPS to BODY. Finish off leaving a long tail. Sew MUZZLE to head of BODY stuffing firmly before closing. Using black, embroider NOSE and MOUTH on MUZZLE. Rd 1: With light blue, ch 5, sc in second ch from hook, sc in next 2 ch, change to red, (3 sc, change to light blue, sc) in next ch working around ch, working in free loops of foundation ch, sc in next 3 ch. (10) Change to white. Finish off leaving a long tail. Sew EYES to head of ARVA. Using black, embroider pupils on EYES and dividing line of eyelids. Fringe on a piece of black for eyelashes. Fringe red yarn on ARVA. Rd 2: Ch 1, turn; sc in each sc across. (32) Change to black. Rw 1: With red, ch 3, sc in second ch from hook and in next ch. (2) Change to white. Finish off leaving a long tail. Sew BELT TEEETH to belt of SKIRT. Rw 3: Ch 1, turn; slip st in next 9 sc, ch 1, 3 sc in same sc as last slip st, (sc in next 5 sc, 3 sc in next sc) twice, leaving remaining sc unworked. Rw 10: Ch 1, turn; sc in next 4 sc, ch 2, sc in second ch from hook, ch 1, skip next 3 sc, sc in next 4 sc. Rw 13: Ch 7, sc in second ch from hook, sc in next 5 ch, sc in next 7 sc, ch 7, sc in second ch from hook, sc in next 5 ch, slip st in bottom of last sc before ch-7. Finish off. Place HALTER TOP on ARVA THE RABBIT. Sew each end of Rws 1 and 2 together. Sew each end of Rw 13 together. Weave in ends. Rd 7: Ch 1, turn; sc in side of next 6 Rws, 3 sc in free loop of foundation ch, sc in side of next 6 Rws. Finish off leaving a long tail in RED TAIL. Finish off and weave in ends in BUFF TAIL. Using tail, sew TAILS together. Stuff TAIL firmly. 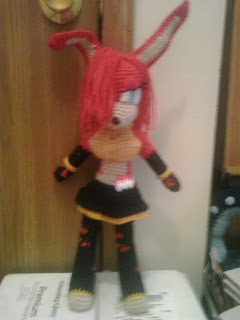 Sew TAIL to ARVA THE RABBIT. This pattern is an original pattern and is © by Christjan Bee (February 2018). Please do not claim this pattern as your own. If you wish to share this pattern, you may link to this pattern but please do not reprint it on your site. You may keep a copy for your own personal use but you may not sell or distribute it, or sell items made from this pattern.